Last weekend I whipped up a quick baby quilt top for a friend using a new pattern by Elizabeth Dackson of Don't Call Me Betsy. I can't share a ton with you yet as she hasn't released the pattern (coming out mid-August) but what I can tell you was that this quilt was a ton of fun to work on! 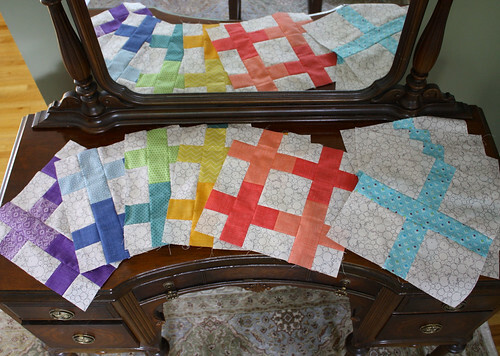 When I received the pattern, I knew immediately what I wanted to do with it, and who to make this quilt for. I pulled fabric from my stash for this quilt in less than 5 minutes (definitely a record for me!). Most of these prints came from my Stash Stack Club subscription and a few are from my LQSs. While I wait ever so impatiently to show you my finished top, I will keep stitching away. So far it's machine quilted and half bound. 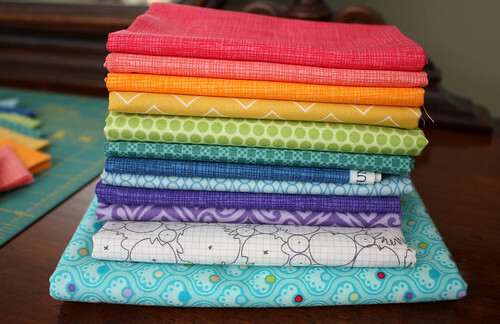 Next up is some yummy hand quilting work to really wrap it up. 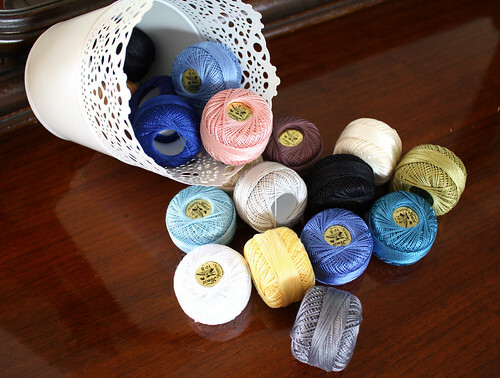 It's a good thing I recently ordered 18 mini balls of Presencia perle cotton (size 8) from Mad About Patchwork. They arrived just in time for this project to come on a road trip with me this weekend. Let the vacation stitchery begin! Looks awesome Kelsey! Love all the colours with the Architextures background! Have fun on your road trip! Ooh - this rainbow is calling out to me! Can't wait to see the full pattern and quilt top! I just got a big pack of pearl cotton too! AND I have that bucket from Ikea... Maybe I'll keep mine in there when I get a sewing room!